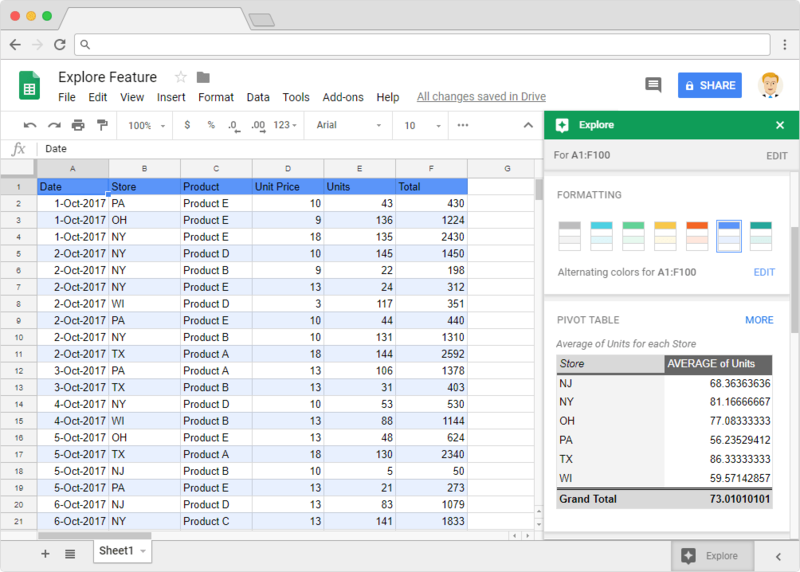 Most of us work with loads of data on our spreadsheets. Wouldn’t it be nice to have an assistant that can help intuitively help us with our work, so that we can speed it up? The Explore feature in Google Sheets does exactly that. It intelligently gathers the context that we are working upon, and gives us the right suggestions that might be suitable for the purpose. And its insightful suggestions include tips for formatting, charting, pivot tables etc. If we can’t find something, we can even ask for answers. No, it isn’t anything like the annoying MS Office Clippy, but rather an extremely intelligent yet reliable assistant. Please note that this functionality is also available on Google Docs and Google Slides. However, we will focus our discussion within the confines of Google Sheets. We have a spreadsheet that has a sample sales data as shown in the screenshot below. Since we are seeking contextual help, let us select one of the cells within the data range. 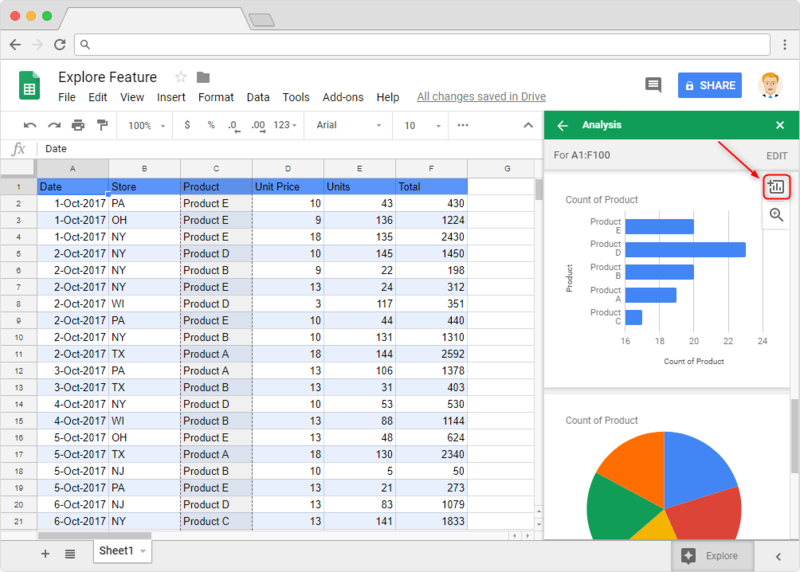 Now let’s click on the Explore button at the bottom right corner of the Google Sheets user interface. 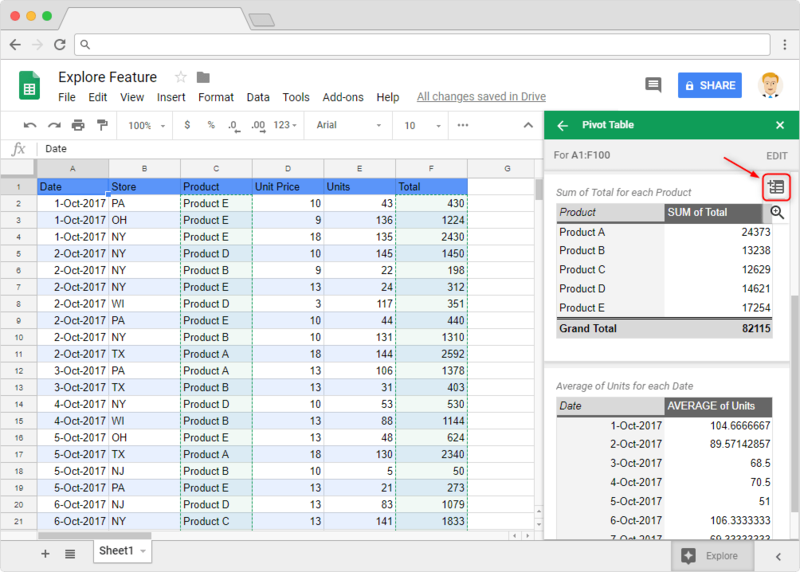 On doing so, we will see a non-intrusive, floating window pane that appears on the right side of the Google Sheets user interface. We’ll notice it comes up with multiple suggestions. 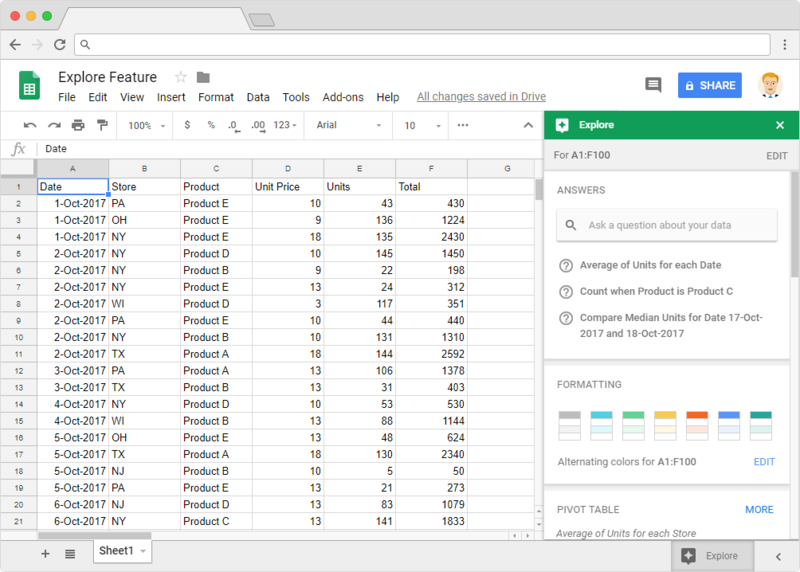 This is where we ask specific Google Sheets questions in the most human way possible, pertaining to the data context that is. It already shows us some of the questions that we might be interested in. Either we can choose one of that, or type our own. 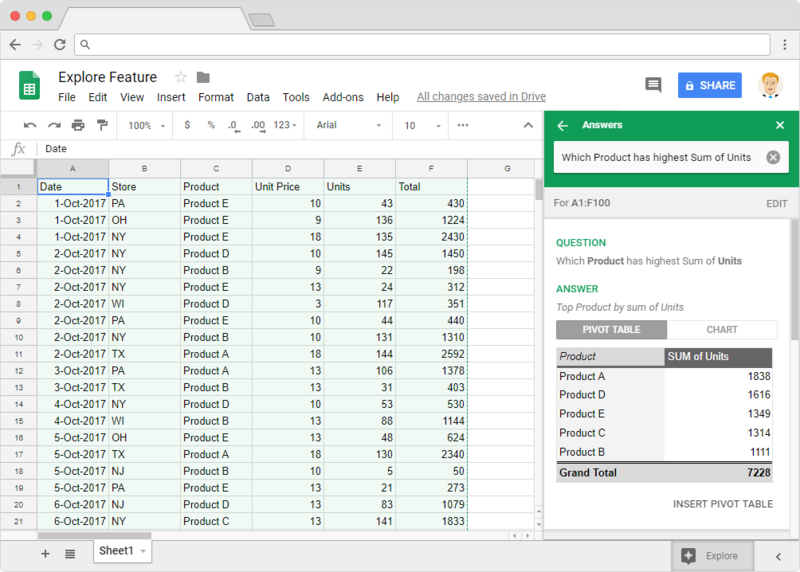 For instance, we tried “Which Product has the highest Sum of Units”, and here’s what it came up with. 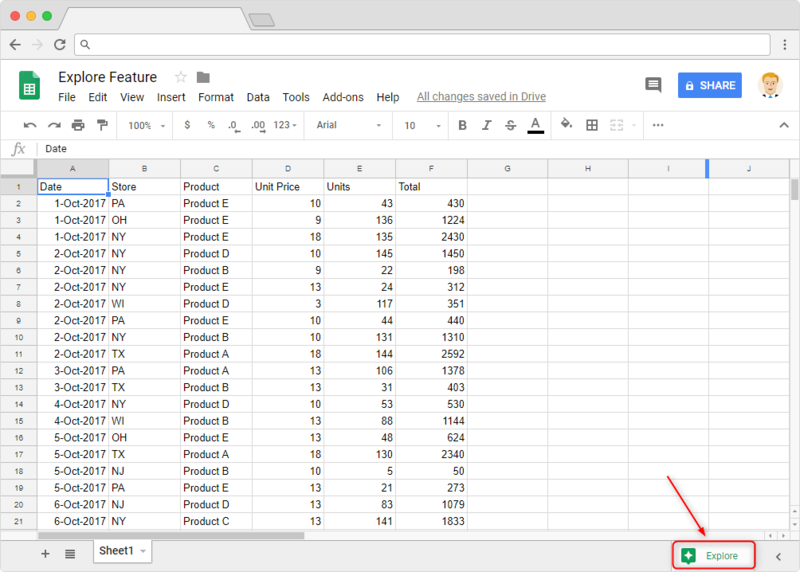 The result shows a pivot table, that has the list of products sorted in a way that the products with higher sum of units is at the top. So, it is very easy to see Product A has the highest number of Units sold. As we can see, it offers us multiple options for “alternating colors”. Although we chose just a single data cell, it automatically recognized the entire data range. So, if we choose one of the suggested options, the formatting will apply to the entire data range. Scrolling further down, we see a suggestion for a pivot table. However, if that is not we are looking for, we can click on the MORE hyperlink within this section to see other options. Let’s just say we liked a suggestion, and want that pivot table. All we have to do is click on the Insert Pivot Table button corresponding to the pivot table suggestion. Doing that will insert a pivot table in a brand new worksheet. 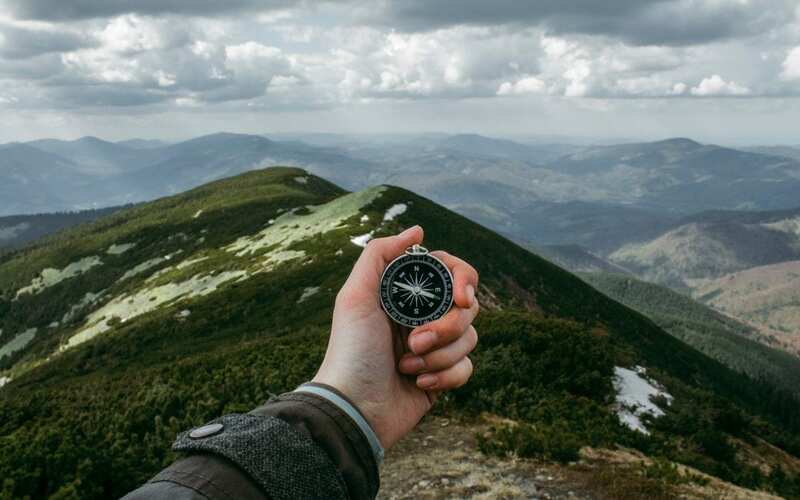 It might so happen that we may not still see what we are looking for. In such scenarios, just insert a pivot table that closely resembles what we are looking for. Insert that table, and then go on to make changes to that table. Depending upon the nature of data, the Explore feature automatically comes up with the most probable charts we would want to use. Scrolling further down to the ANALYSIS section reveals the charting suggestions it came up with. Like we did in the PIVOT TABLE section, we can click on the MORE hyperlink if we don’t see the chart of our liking. Once decided with the chart, just click on the Insert Chart button corresponding to the chart we want to insert. Again, should we need to edit the chart that we chose, we can easily do so. The Explore will bring up the suggestions that it deems fit to the context of the spreadsheet. Needless to say, the suggestions can vary depending upon the composition of the underlying data set.